Long-Handled Bottle Carrier Lightweight And Durable. Elderly users in particular will find this item useful - This long handled nylon coated wire frame carrier makes it easy to lift and carry milk or other bottles. No need to bend down to pick up or carry your bottles. It's lightweight and durable, it frees up your other hand for support. However have you managed without a bottle carrier before? I am highly delighted with the milk carrier. 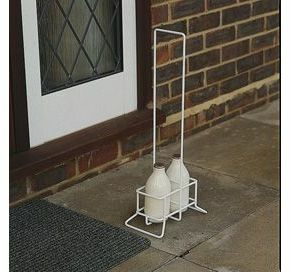 I had quite a bad stroke in January and though I am making quite a good recovery still find some things difficult and the milk carrier solves the problem of getting the milk in from the doorstep so much easier. I was most impressed as well with your service. Ordered on the Monday and received it Tuesday morning. Well done!